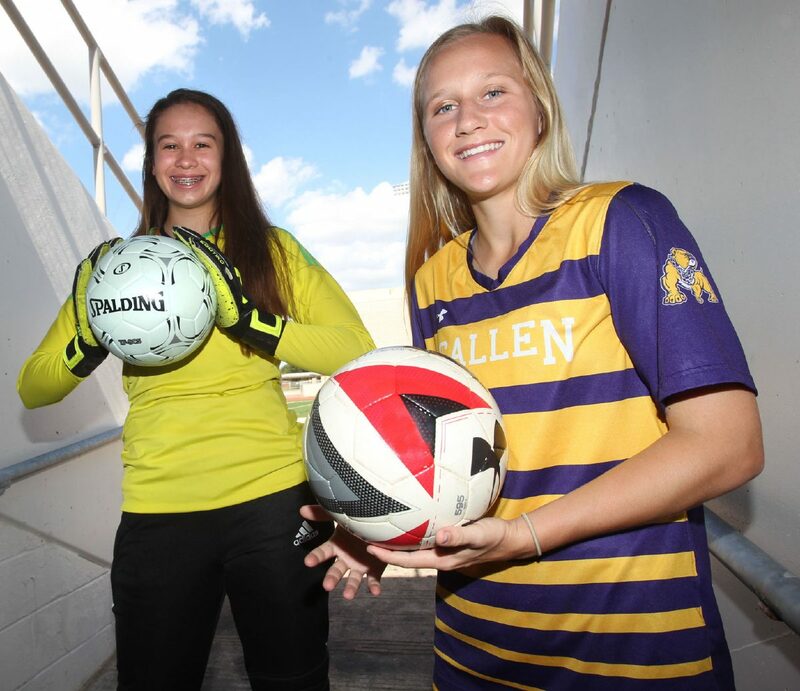 McALLEN — When McAllen High lined up against Austin Lake Travis on April 14, the Bulldogs entered a match as underdogs for just the second time all season. The only other time was 22 hours earlier, when they faced San Antonio Johnson in the regional semis. On both occasions, sophomore Lexi Gonzalez played well on the pressure-packed stage to send the Bulldogs to the state tournament. They advanced via a 2-1 win in the semis and a stellar 1-0 shutout performance with 12 saves by Gonzalez in the final against Lake Travis. The 16-year-old said that the big moments actually helped, and she was excited to get into heated contests. 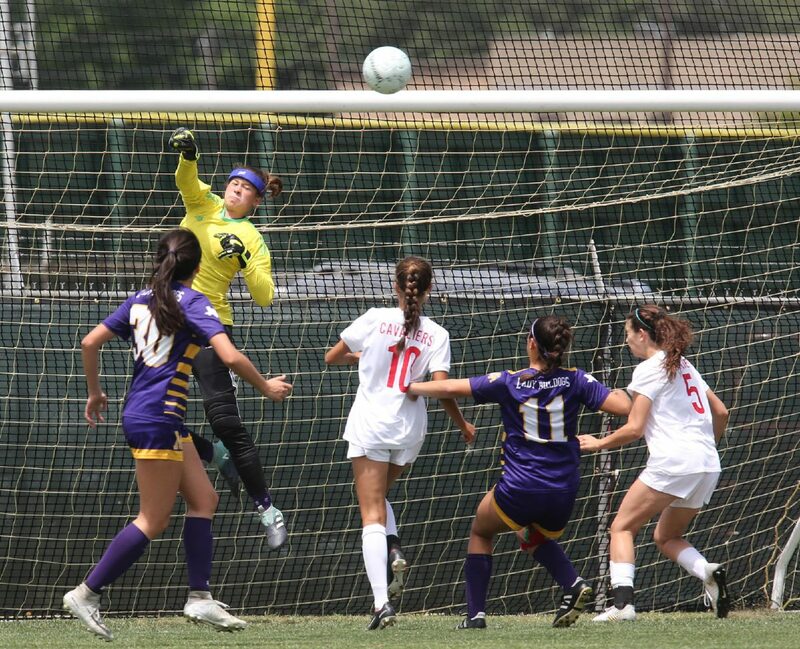 McAllen High goaltender Lexi Gonzalez punches away an Austin Lake Travis corner kick during the first half of their Class 6A regional final match Saturday, April 14, 2018, at Blossom Athletic Center in San Antonio. McAllen High won the match 1-0. McHi's Lexi Gonzalez and Westyn Henderson pose for a photo at McAllen Veterans Memorial Stadium Monday, May 28, 2018. Gonzalez drew from her time playing defense, where she was needed during the early parts of the year. She even used her 5-foot-10-inch frame to hit home a header during the season. All those tools factored into Gonzalez’s selection as The Monitor’s All-Area Defensive Player of the Year. She was not shaken before the regional final game, even with knowledge that LakeTravis had scored five goals in its semifinal match against Brownsville Rivera. She knew that she had done her part against Lake Travis and the first goal would be the game-winner. Lake Travis had plenty of high-quality chances to get on the board over the course of the match. Gonzalez, however, showed off her talents and was a wall, making dives and quick reactions to keep the ball out. She even borrowed a move from her other passion, volleyball, when on two occasions she tipped dangerous crosses over the bar. The Bulldogs fell 2-0 in their state semifinal match against eventual champions Houston Memorial, but Gonzalez was named to the 2018 All-Tournament team along with fellow sophomore Westyn Henderson.